In this episode, co-hosts B.L. 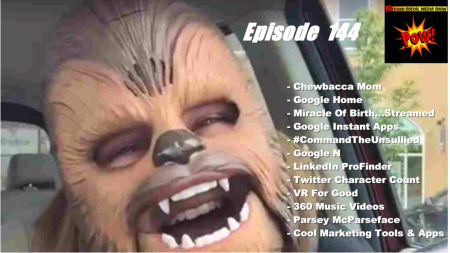 Ochman and David Erickson discussed the hilarious Chewbacca Mom viral video that became Facebook Live’s most-watched video ever; the Pros & Cons of LinkedIn Pro Finder; announcements from the Google I/O Developer Conference, Sky TV’s #CommandTheUnsullied Tweet bots spam Twitter; dad accidentally streams baby’s live birth on Facebook; Occulus $1M VR for good initiative; Blab quits mysteriously; Twitter stops counting images and links in 140-character count; plus cool tools and stats you should know. The video is time-stamped. Click on a time [in brackets] to jump directly to that segment of the video. What Could Possibly Go Wrong When Google Asks The Internet To Come Up With An N-Word? Beyond Social Media Show is now on Google Play Music, iTunes & Stitcher!